Why Choose Us for Garage Floor Epoxy? They only acid wash or lightly “grind” the concrete for prep. They use only 50% - 75% solids epoxy. They skimp on color flakes which creates an uneven partial flake floor. They use clear urethane or epoxy coatings for the topcoat that WILL yellow over time. They offer very limited warranties and service after the project is completed. We fully grind surface of concrete to remove weak surface of concrete. We use 100% solids Pure Polyurea. We 100% broadcast color flakes on floor for an even consistent look. We use non-yellowing UV stable Polyaspartic Polyurea topcoat. We offer a 15 year materials and workmanship guarantee. It’s pretty amazing to see how something as simple as a garage floor epoxy coating can transform your garage from dirty and drab feeling to presenting a finished, colorful, clean showroom look. With plenty of different options available, Spray ‘n Coat can help you pick a color and floor style that gives you the look, protection and cleanability you’ve wanted. The first thing to know about garage floor epoxy coatings is that there is a wide variety of coatings available, and they are not all created equally. The”big box” stores along with the local paint stores all sell garage floor epoxy kits that are quite do-it-yourself friendly. 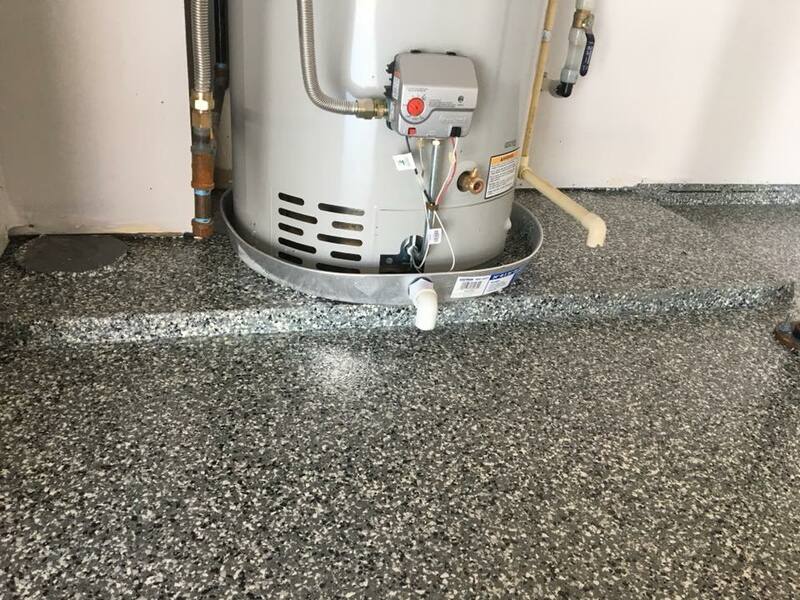 While these kits mimic the look of a professionally installed floor, they really don’t hold up to expectations when it comes to overall performance and durability. that is necessary to prevent hot tire peeling down the road. They are also only about as thick as regular house paint and so they will show all the blemishes in the concrete floor that our thicker, 100% solids epoxy will hide. Another tempting option is the epoxy garage floor coatings that many painters will offer to apply. While more expensive and more durable than the epoxy garage floor kits offered at the local big box stores, these standard industrial garage floor epoxy coatings are still considered a thin film system and do not have the same performance as a true 100% solids commercial epoxy coating designed for high-performance floor application. The painters who apply these industrial epoxy coatings on your garage floor often do not have the experience with epoxy floor coatings to know how to properly prep the floor to have the epoxy permanently bond to the concrete. The type of epoxy garage floor coating that we recommend is a commercial grade 100% solids epoxy that we apply using a trowel or squeegee. Yes, it is that thick! Once we have used our diamond bit grinder to create the proper profile on your concrete, we clean up the dust and apply the epoxy as either a top coat or a primer/base coat if we are broadcasting color flakes into it. After spreading the color chips to the point of rejection—which means we have covered the floor with so many color chips you can’t even see the base coat of epoxy—we clean up the excess chips once the coating dries. Then we apply the top coat of polyaspartic to the floor. This is a product that is similar to epoxy but has better UV stability; it won’t yellow and is highly chemical- and abrasion-resistant. Epoxy coatings bond extremely well to concrete but tend to yellow and chalk when exposed to sunlight. So in the case of a garage, every time the garage door is opened the floor gets sunlight and so that part of the garage often will yellow and become chalky over time. Using our polyaspartic finish as the clear coat or colored coat for the final step solves that problem. Our garage floor epoxy coatings come in a huge range of colors and designs. This includes quartz floors instead of the color chips, as well as metallic floors for that unique look. Request a free quote to hear more about how we can help you transform your garage into a space you will enjoy to look at and be organized in.